I published this post last October, before the extent of interest in the 100th anniversary celebrations of the event commemorated in this 4-pp pamphlet had become clear. I am relieved to report that no suspicious flurry of spurious Emily Davison-related items has appeared on the market. 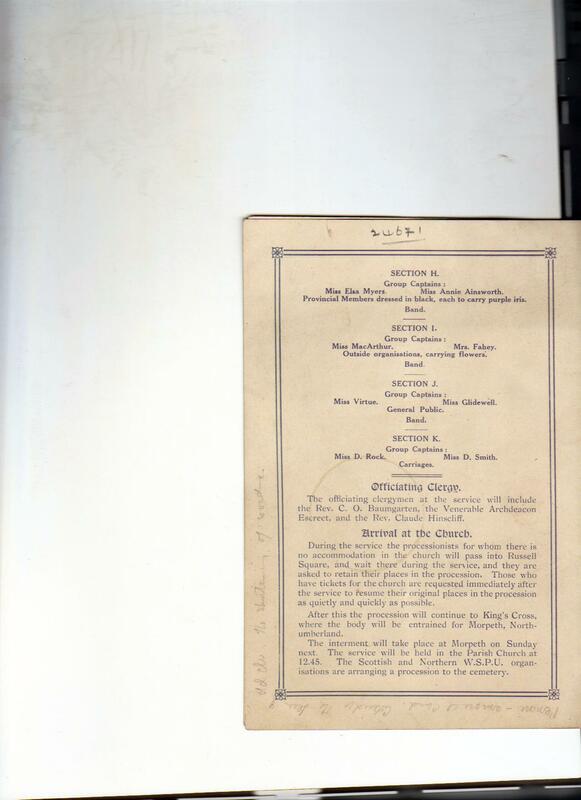 Although the main text of this post is as it first appeared I have updated it with two extra scans of the inside and back cover of the programme. They were made merely for my own research purposes some time before I had a visually-sophisticated blog audience to amuse – so – apologies for their appearance – but I think you will find the details of interest. 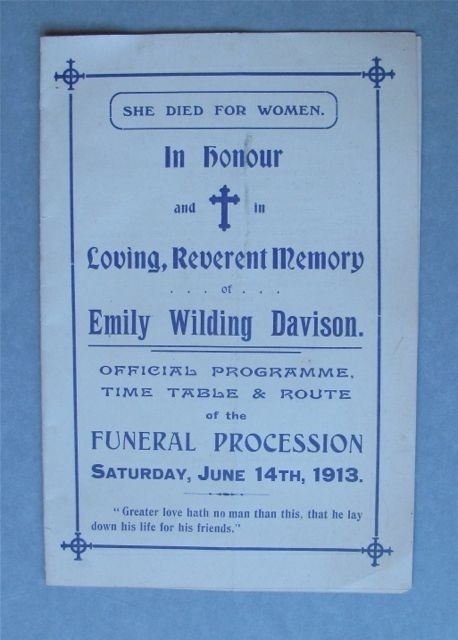 For the last 100 years the strange death of Emily Wilding Davison has transfixed the public. It is likely to be the one thing that the ‘man – or woman – in the street’ knows about the suffragette movement. Bizarrely the last seconds of her conscious life are still with us –growing in impact as the internet allows everyone to view footage of film that was in the past relatively difficult to access. In this piece by Andrew Marr the BBC has worked its wonders on the Pathé News original, allowing us to see details that the passing years had blurred. I have always wondered if it was by chance that she chose to position herself alongside a section of the Derby racecourse that was in full view of the film camera. The camera was mounted on a stand and would have been clearly visible. However the camera was, presumably, positioned there in order to capture pictures of the horses entering the final straight and Emily Davison may have chosen to be there for the very same reason. You will now have had the opportunity of viewing the enhanced footage of the film broadcast by Channel 4 in Clare Balding’s Secrets of a Suffragette. 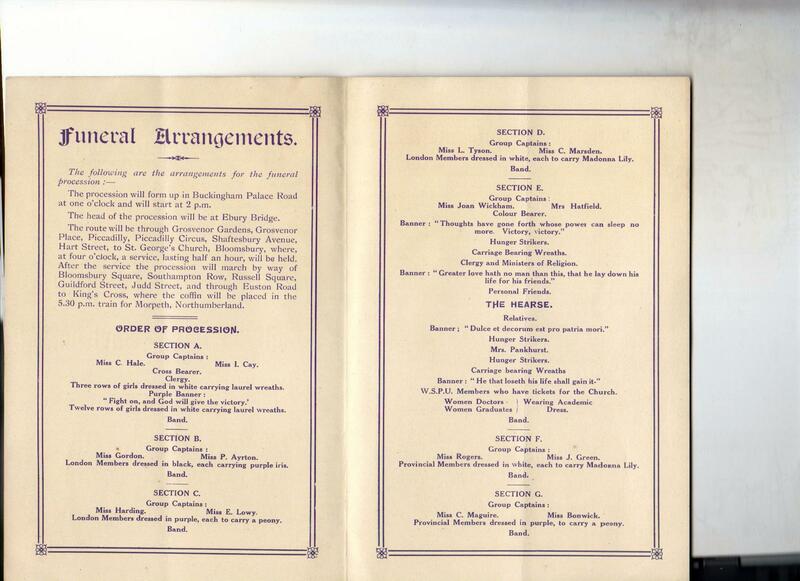 All material related to Emily Wilding Davison’s funeral is scarce – and very collectable – however one of the scarcest is the 4-page ‘Official Programme, Timetable and Route of the Funeral Procession, Saturday June 14th 1913. This entry was posted on June 14, 2013, 8:33 am and is filed under Collecting Suffrage, Suffrage Stories. You can follow any responses to this entry through RSS 2.0. You can leave a response, or trackback from your own site.